Local contractors and others peer over a solar panel array on the roof of the Porter County Career and Technical Center in August. 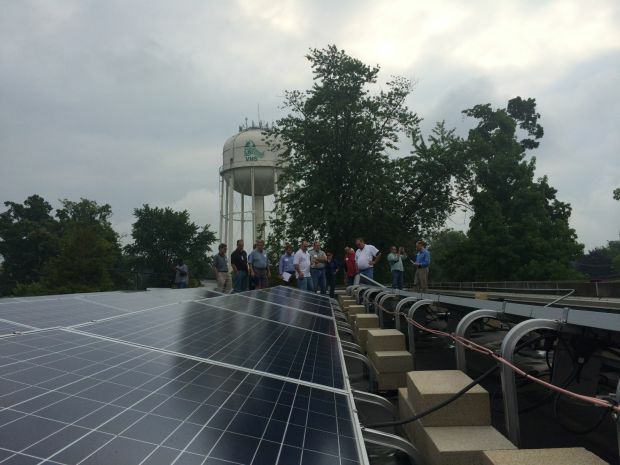 The group participated in a Solar Ready II tour hosted by the Northwestern Indiana Regional Planning Commission. Whenever you take a road trip (as my family recently did), it is, of course, important to get to your final destination. But what makes any road trip memorable are the opportunities along the way that enrich your trip while still getting to where you want to go. It’s the same with the future of Northwest Indiana. The region is not operating in a vacuum. Within the past five years, regionally minded citizens of Northwest Indiana came together in unprecedented numbers to plan the region’s “road trip” not just for the next five years, but for the next 25. That future, laid out in the 2040 Comprehensive Regional Plan: A Vision for Northwest Indiana, is fresh and compelling, and shapes not only what we’ll be doing for the long term, but also how we approach opportunities in the short term.